The sales floor associates are responsible for receiving, storing and issuing sales floor merchandise. Working mostly for retail establishments, these associate take charge of various roles and responsibilities such as – stocking shelves or racks with merchandise, arranging the merchandise in an attractive manner, counting stock periodically, checking and marking merchandise, comparing merchandise with invoice, setting up advertising signs, receiving customers and demonstrating product features, maintaining store cleanliness, itemizing and totaling customer’s billing, helping in transportation of goods, cutting and making changes in the product as per the customer’s requirements. The ideal candidate should mention throughout the sales floor associate resume sales expertise, stamina, enthusiasm, good communication abilities, data entry and billing knowledge, excellent memory or recollecting power, the ability to stand, work and walk for an extended time period and maintaining a positive attitude towards work and customers. Qualifications include a high school diploma or an Associate’s degree. Summary : 7+ years of experience as a Sales Floor Associate is seeking to reinforce my career with an established company that will enable me to continuously impart, enhances and broaden my knowledge and skills in the practice of my profession. 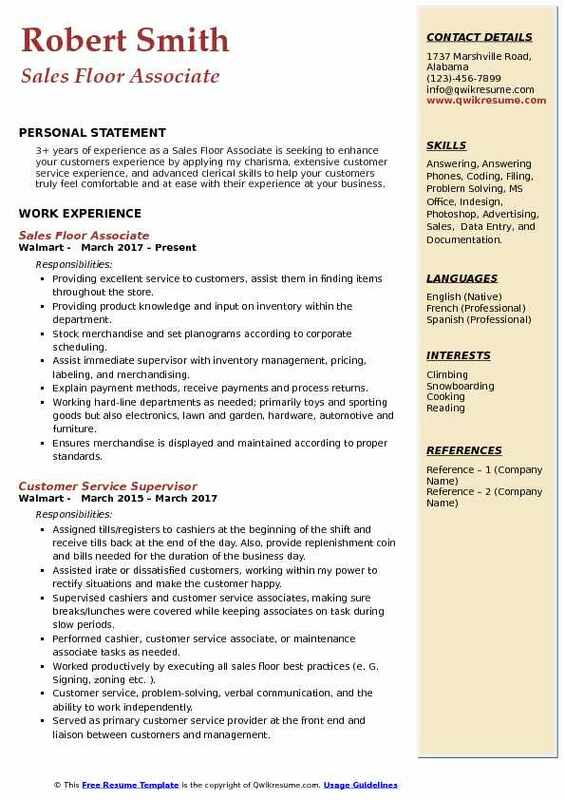 Skills : MS Office, Customer Service, Retail Marketing, Retail Sales, Languages Spoken And Written: English And Filipino, Good Interpersonal Reliable And Adaptable. Proactively assessing guests needs and recommend the right product, accessories and services-answer guests questions and help guest select and purchase the right product. Ensuring sales plans are set on time and according to processes, adhere to street dates for new merchandise. Maintaining sign and labels to communicate accurate prices to guests and follow signing and merchandising processes. Stock merchandise pulled from the backroom/under stock to keep the shelves in stock. Know and follow area-specific merchandising guidelines for pre-transition merchandising (PTM) areas. Supporting food freshness standards, product rotation (FIFO), no expired products, removed dented or damaged products properly handle temperature-sensitive food items and ensure cleanliness to prevent the pest infestation when handling food items. Supporting the shortage prevention culture; understand how operational procedures affect shortage; avoid shortcuts, and notify supervisors of any concern. Ensuring proper equipment guidelines are followed when team members check out equipment. Sharing available/current promotions with guests (circular, cartwheel and weekly ads). Providing great service by proactively greeting and assisting guest in the fitting room area in between answering all external and internal phone calls friendly and quickly; efficiently direct calls to the team member. 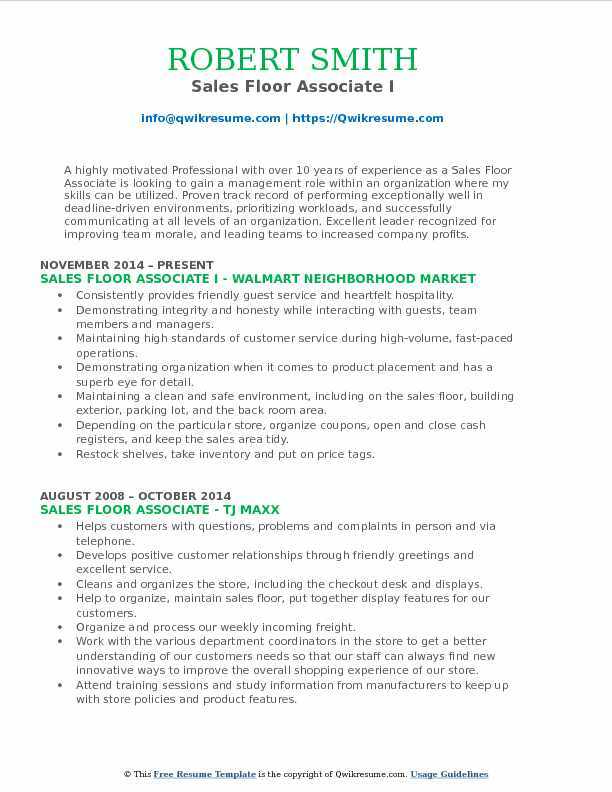 Objective : Reliable and Punctual Sales Associate who possesses an excellent work ethic and over 3 years of experience in retail is now looking to obtain a position where I may maximize my excellent customer service, managerial and organizational skills. Skills : Problem Solver, Inventory, Cash Management and Exceptional Customer Service, Complete Knowledge Of Safety Policies, Team Builder, Adobe, And MS Office. Greet and help customers find items in the store they require, making suggestions for substitutions if needed. Explain the drawbacks and benefits of brands or models of merchandise. Stocking all the products on the shelves and in the store properly for easy access. Ensuring work area and the aisles are clean and are free of any sorts of odor. Coordinating with the sales/purchase team and colleagues; ensuring out-of-stock situation. Executing marketing initiatives and campaigns to further penetrate the customer base. Planning, developing, and execute sales strategies tailored to driving new business and the retention of existing clients. 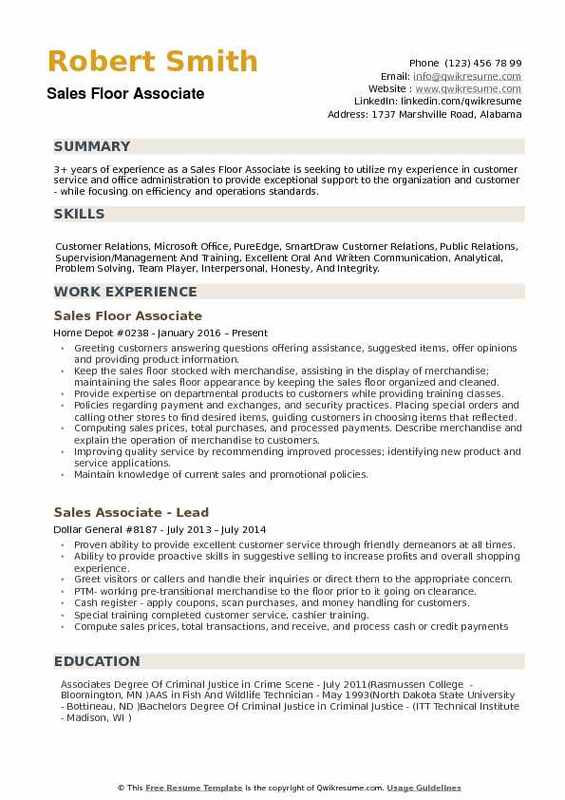 Summary : More than 11 years of work experience as a Sales Floor Associate. Reliable with strong organizational skills, both in cognitive thinking and documents keeping. A result-oriented person who continues to maintain a strong work ethic, responsible, punctual and friendly attitude, a colossal asset to any prospective hiring firm. Skills : Autocad, Building Code, Customer Service, Databases, Data Entry, Encoder, Excel, MS Word, Organizational, Punctual, Retail Sales, Wiring Schematics, And Knowledgeable In Green Building Design. Quoting prices and discounts as well as credit terms, trade-in allowances, warranties and delivery dates. Preparing sales contracts and accepting payment through cash, cheque and credit card. Using a handheld computer to enquire, adjust, and print company related labels. Assisting members in locating merchandise, researching SKUS and picking merchandise, not in stock. Operating various manual/electrical equipment to stage and drop merchandise. Greeting and helping each customer, stock, cash register, closing duties. Showcase products on the floor or recommend a product to best fit the customers' need. Designed and implemented a sales development program for all incoming sales team members. 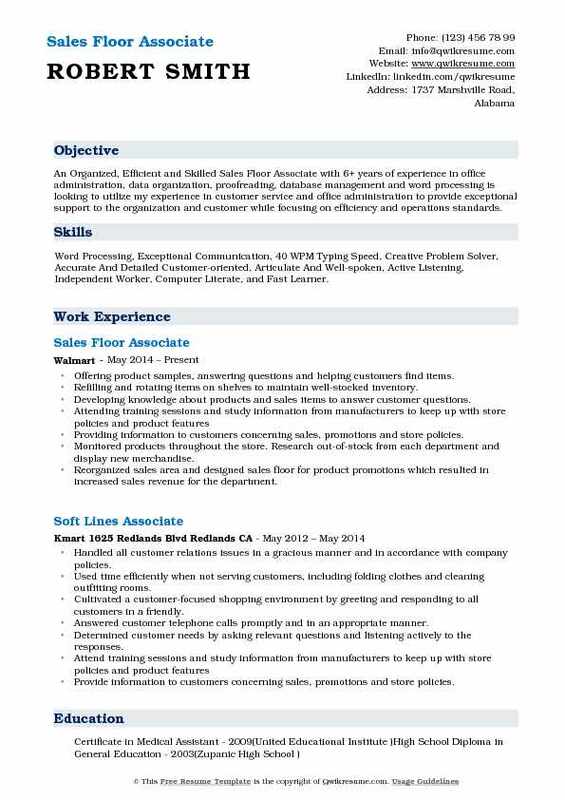 Summary : Dedicated and outgoing with over 17 years of experience as a Sales Floor Associate. Enjoy having a friendly face to face interactions with everyone. Energetic, bi-lingual and willing to see every task through until the end. Skills : Computer Literate, Customer Service, Team Building, Organizational, Public Speaking, Typing 90wpm, MS Office, Adobe, Strategic Planning, Interpersonal Skills, Goal Oriented, Problem Solver and Excellent Communication. Answering customers questions about merchandise and advise customers on merchandise selection. Itemize and total customer merchandise selection at checkout counter, using the cash register, and accept cash or charge card for purchases. Taking inventory or examine merchandise to identify items to be reordered or replenished. Stocking shelves, racks, cases, bins, and tables with new or transferred merchandise. Designing and set up advertising signs and displays of merchandise on shelves, counters, or tables to attract customers and promote sales. Assisting in keeping the backroom and back side of building organized and clean using an electric pallet jack, walkie stacker, and forklift. Increased sales for the frozen and dairy department by 10%. Driving sales and guest assistance across all departments of the store. Duties include guest assistance in electronics, hardlines, and consumables. 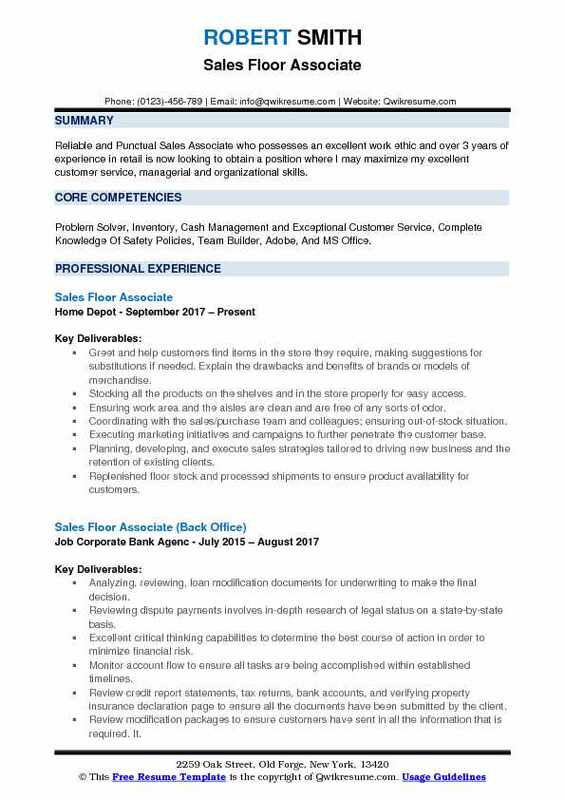 Objective : 4 years of experience as a Sales Floor Associate is seeking to obtain a challenging position in the workforce, where my customer service and technical skills could be leveraged. I excel at working with people and possess strong communication skills and will be a valued addition to any company. Skills : MS Office, Customer Service, Coding, Filing, Problem Solving, Adobe, Bookkeeping, Documentation and Strong Communication Skill. Greet customers, ask what they want, answer questions and recommend merchandise. Sold merchandise at a retail store, answered customer questions. Trained other workers, created displays and cleaned work area. Answered phone calls, made sure all the departments were neat and clean as well as set up. Restocking the sales floor, organize product shelves and leave them in proper presentation condition. Returns merchandise from the recycling and fitting room to the assigned floor. Showed willingness to learn new skills to help the store, team, and self. Maintained signs and labels to communicate accurate prices to customers. 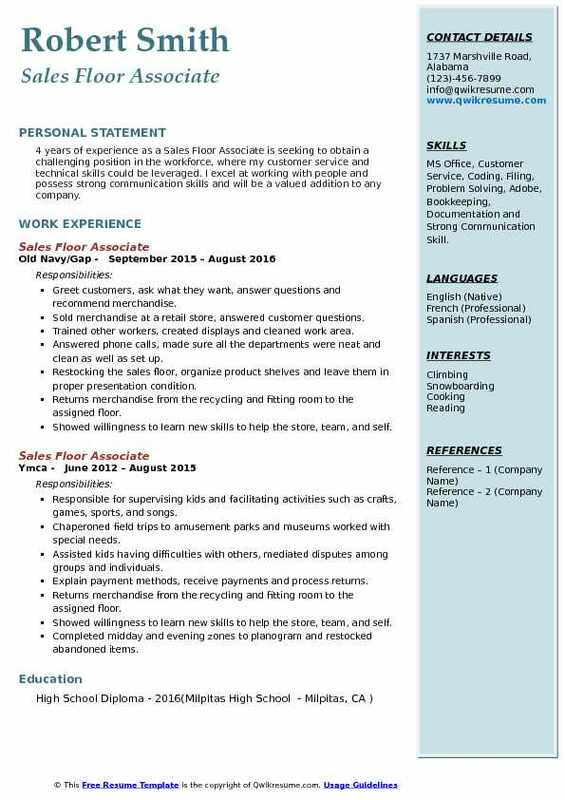 Headline : An Organized, Efficient and Skilled Sales Floor Associate with 6+ years of experience in office administration, data organization, proofreading, database management and word processing is looking to utilize my experience in customer service and office administration to provide exceptional support to the organization and customer while focusing on efficiency and operations standards. 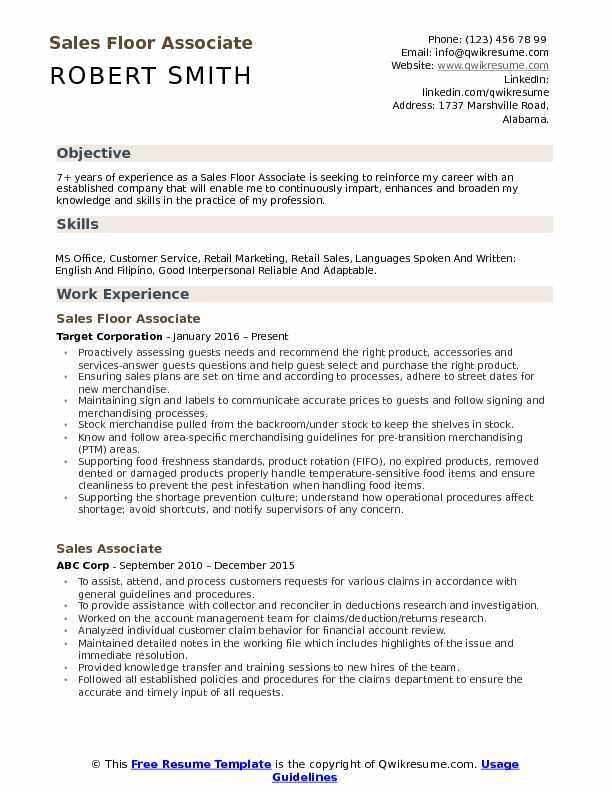 Skills : Word Processing, Exceptional Communication, 40 WPM Typing Speed, Creative Problem Solver, Accurate And Detailed Customer-oriented, Articulate And Well-spoken, Active Listening, Independent Worker, Computer Literate, and Fast Learner. Offering product samples, answering questions and helping customers find items. Refilling and rotating items on shelves to maintain well-stocked inventory. Developing knowledge about products and sales items to answer customer questions. Providing information to customers concerning sales, promotions and store policies. Monitored products throughout the store. Research out-of-stock from each department and display new merchandise. Reorganized sales area and designed sales floor for product promotions which resulted in increased sales revenue for the department. Set and display weekly advertisements, greeted customers, performed sales and cashier duties. Summary : A highly motivated Professional with over 10 years of experience as a Sales Floor Associate is looking to gain a management role within an organization where my skills can be utilized. Proven track record of performing exceptionally well in deadline-driven environments, prioritizing workloads, and successfully communicating at all levels of an organization. Excellent leader recognized for improving team morale, and leading teams to increased company profits. 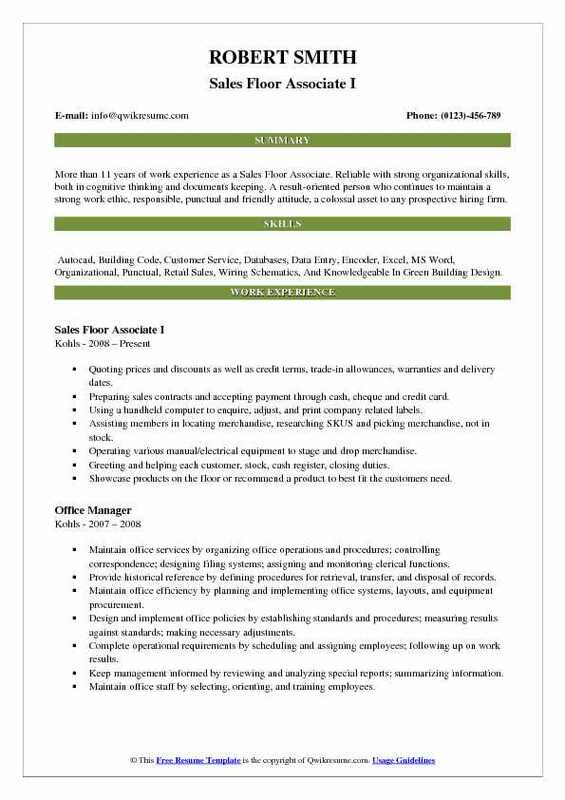 Skills : MS Office, QuarkXPress, Adobe, Type 65 WPM, Excellent Spelling And Grammar, High Math Aptitude, Computer Art Programs (Photoshop, Illustrator, InDesign, etc. ), Internet Explorer, Windows XP, Windows Vista, OpenOffice.org 2.4, OpenOffice.org 3.3, And Windows Mail. Consistently provides friendly guest service and heartfelt hospitality. Demonstrating integrity and honesty while interacting with guests, team members and managers. Maintaining high standards of customer service during high-volume, fast-paced operations. Demonstrating organization when it comes to product placement and has a superb eye for detail. Maintaining a clean and safe environment, including on the sales floor, building exterior, parking lot, and the back room area. Depending on the particular store, organize coupons, open and close cash registers, and keep the sales area tidy. Restock shelves, take inventory and put on price tags. Watching out for security and following store's procedures in the event of theft. 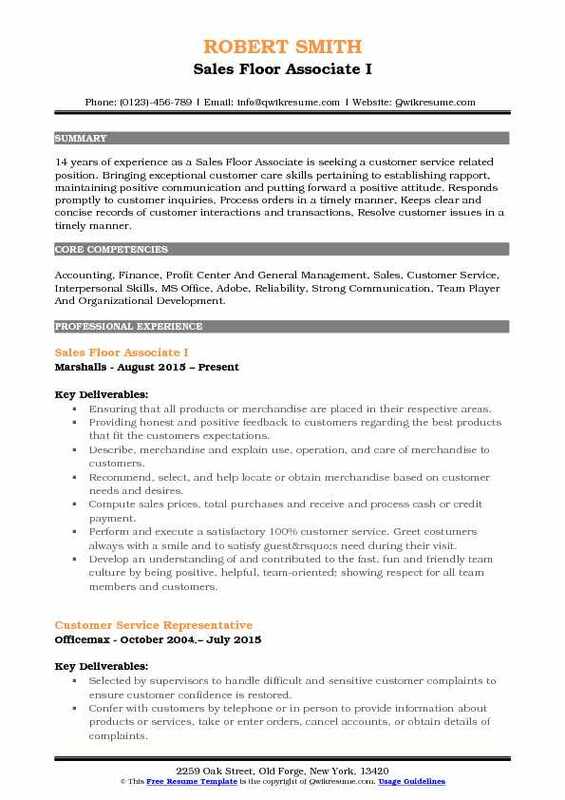 Summary : 14 years of experience as a Sales Floor Associate is seeking a customer service related position. Bringing exceptional customer care skills pertaining to establishing rapport, maintaining positive communication and putting forward a positive attitude. Responds promptly to customer inquiries, Process orders in a timely manner, Keeps clear and concise records of customer interactions and transactions, Resolve customer issues in a timely manner. Skills : Accounting, Finance, Profit Center And General Management, Sales, Customer Service, Interpersonal Skills, MS Office, Adobe, Reliability, Strong Communication, Team Player And Organizational Development. Ensuring that all products or merchandise are placed in their respective areas. Providing honest and positive feedback to customers regarding the best products that fit the customer's expectations. Describe, merchandise and explain use, operation, and care of merchandise to customers. Perform and execute a satisfactory 100% customer service. Greet costumers always with a smile and to satisfy guest’s need during their visit. Develop an understanding of and contributed to the fast, fun and friendly team culture by being positive, helpful, team-oriented; showing respect for all team members and customers. Stock merchandise pulled from the backroom to keep the shelves full. Administering all point of sale opening and closing. 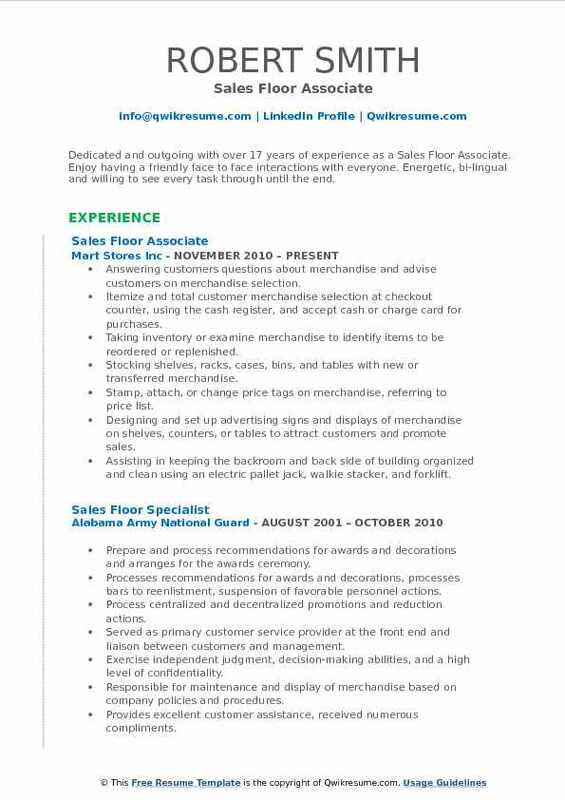 Objective : 3+ years of experience as a Sales Floor Associate is seeking to enhance your customers experience by applying my charisma, extensive customer service experience, and advanced clerical skills to help your customers truly feel comfortable and at ease with their experience at your business. Skills : Answering, Answering Phones, Coding, Filing, Problem Solving, MS Office, Indesign, Photoshop, Advertising, Sales, Data Entry, and Documentation. Providing excellent service to customers, assist them in finding items throughout the store. Providing product knowledge and input on inventory within the department. Stock merchandise and set planograms according to corporate scheduling. Assist immediate supervisor with inventory management, pricing, labeling, and merchandising. Explain payment methods, receive payments and process returns. Working hard-line departments as needed; primarily toys and sporting goods but also electronics, lawn and garden, hardware, automotive and furniture. Ensures merchandise is displayed and maintained according to proper standards. Objective : 3+ years of experience as a Sales Floor Associate is seeking to utilize my experience in customer service and office administration to provide exceptional support to the organization and customer - while focusing on efficiency and operations standards. Skills : Customer Relations, Microsoft Office, PureEdge, SmartDraw Customer Relations, Public Relations, Supervision/Management And Training, Excellent Oral And Written Communication, Analytical, Problem Solving, Team Player, Interpersonal, Honesty, And Integrity. Greeting customers answering questions offering assistance, suggested items, offer opinions and providing product information. Keep the sales floor stocked with merchandise, assisting in the display of merchandise; maintaining the sales floor appearance by keeping the sales floor organized and cleaned. Provide expertise on departmental products to customers while providing training classes. Policies regarding payment and exchanges, and security practices. Placing special orders and calling other stores to find desired items, guiding customers in choosing items that reflected. Computing sales prices, total purchases, and processed payments. Describe merchandise and explain the operation of merchandise to customers. Improving quality service by recommending improved processes; identifying new product and service applications. Maintain knowledge of current sales and promotional policies.